Supernova remnant SNR1987A is located 166 000 light-years away in the Large Magellanic Cloud. Supernova remnant SNR1987A is located 166 000 light-years away in the Large Magellanic Cloud in this space wallpaper. The light from the stellar explosion arrived at Earth in 1987, and has since provided astronomers with a natural laboratory to monitor how the brightness of a supernova changes over time. Dominating this Hubble Space Telescope view of the remnant are two glowing loops and a very bright ring of shocked hotspots surrounding the location of the now-exploded central star. 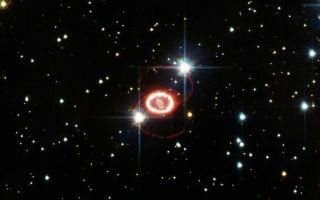 The material making up these loops and rings was probably ejected from the star earlier in its history and is now being illuminated by the supernova and its shockwave. This image was taken Oct. 17, 2012.